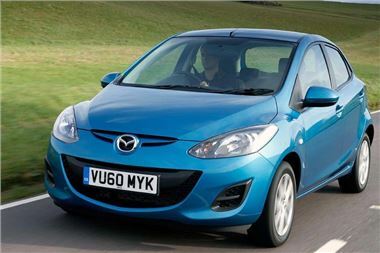 The significantly upgraded Mazda2 model range is now on sale in the UK priced from £9,995 (on-the-road). The nine-strong line-up of three-door and five-door hatchbacks offers customers a choice of three petrol and one diesel powertrains and four generous equipment levels. Responding to public demand, two new models are added to the range – an automatic model (with a 1.5-litre engine and four-speed transmission) and the ‘Tamura‘ offering sporty looks at a high-value price. New features appearing across the entire upgraded Mazda2 range deliver significant improvements to interior comfort, ride quality, handling and refinement. Outside, the Upgraded Mazda2 carries forward the “exquisite and dynamic” design concept while blending the brand’s ‘family face’ with a larger five-point grille and larger Mazda badge to harmonise the Mazda2 with the whole product line-up. Plus the Mazda2 features newly designed front fog lamp bezels and wheels which create a stronger sense of quality and sportiness. Inside, finishes and decorative parts are revised for a higher quality feel throughout the cabin, included is a newly designed instrument panel, new seat patterns and seat fabric colours, meter panel with blackout finish dials and chrome rings, while the centre stack is finished in piano black. Road holding and ride comfort have been improved thanks to a stiffer bodyshell, changes to the front suspension geometry, softer mountings for the rear trailing arms and re-tuned rear dampers. For the upgraded Mazda2’s powertrain line-up, the three petrol engines have been re-tuned to Euro Stage 5 whilst the five-speed manual transmission’s gearing has been revised – by between 7.7 and 5.7 percent across the 2nd-to-5th ratios – to save fuel. These changes achieve significantly improved fuel economy (by up to 2 percent) and reduced CO2 emissions (by up to 4.8 percent). For both the low and high power 1.3 engines, the CO2 output has been cut from 125 to 119g/km – meaning that five petrol Mazda2 cars now have a rating under 120g/km and move to the lower tax ‘C’ band, while the diesel model moves down to band ‘B’, so six models qualify for £0 Road Tax first-year rate and reduced Benefit in Kind costs, offering users significant savings. In their latest forms, the 1.3-litre engine is available in two power outputs (75ps and 84ps) and the 1.5-litre generates 102ps, while the 1.6-litre turbo-diesel now produces 95ps – a 5.5 percent increase. The Mazda2 TS2 Activematic combines the powerful 1.5-litre petrol engine from the Sport version with the Mazda four-speed automatic transmission. Top speeds range from 104-to-115mph and acceleration times from 0-to-62mph are between 10.7 and 14.9 seconds – depending on model. Fuel economy varies between 44.8 and 67.3mpg (combined cycle), while CO2 ratings spread from 110 to 146g/km. Prices for the regular Mazda2 range start at £9,995 (on-the-road), with TS2 models beginning at £10,820, the new Tamura at £11,520 and Sport models from £12,630. A choice of nine exterior colours is available, with Brilliant Black (£260) and seven mica or metallic finishes (£410) as options. Equipment levels on the Mazda2 range have always been unusually generous for a B-segment supermini. Now with the upgraded line-up, every model comes with remote central locking, air-conditioning, electric front windows, electric door mirrors, a piano black centre stack, CD radio with Auxiliary jack and a Thatcham Category 1 alarm. Moving up the range, TS2 models feature 15-inch alloy wheels, side and curtain airbags, leather steering wheel with audio controls, two additional audio speakers, 60/40 split rear seats, trip computer with speed alarm and (on the automatic) Dynamic Stability Control (DSC). The new Tamura model adds 16-inch alloy wheels and a Sports Styling Kit with side skirts, rear spoiler and four-lamp headlights to the TS2 features. Sport models also feature 16-inch alloy wheels, plus Sports seat trim, front fog lights, auto-lights and auto-wipers, cruise control, automatic climate control air-conditioning, electric rear windows (on the five-door) and DSC.